In January Andrew Wagner set up a Git repository to help organize and facilitate future work on adding support for chromatic staves to Lilypond. The most recent version of Kevin Dalley’s code is now hosted there, including the Mark Hanlon’s updates to it. This will make it easier for developers to work with the code, keep it compatible with newer versions of Lilypond, and eventually contribute our code back to the official Lilypond application. 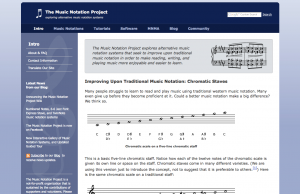 Read more about it on the repository’s wiki and our Lilypond and Alternative Notation Systems page. A big thank you to Andrew for his work on this! In other software news, a third application for Klavar notation has been brought to our attention. It is called KLAVAR!, and has been added to our Software page where it joins KlavarScript and Klavar Music Writer. KLAVAR! was originally written in GFA Basic for the Atari ST. Marco Mascioli has started work towards porting it to MS Windows, Apple Mac OS X, and Linux. He is affiliated with the KlavarScore website. A screenshot of the old site layout. 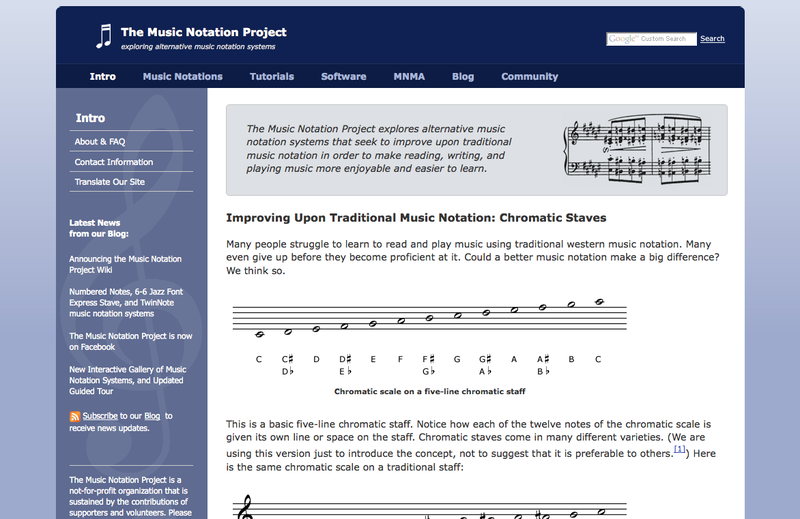 The Music Notations section of the site has also received various refinements including making it clearer that the notation systems are ordered primarily by line spacing, and then by the number of lines per octave. Has the layout of the site changed? It looks pretty much the same to me as shown in the picture in the post. Not complaining, its pretty simple and good, just curious.